To download a PDF version, please provide your email address. By providing your email address, you agree not to use the “Herbs for Depression Mini Reference” as a user guide or to provide medical treatment. But to instead use it as an educational resource. You also agree to receive quarterly emails which may include our newsletter and updates to these mini references. The Herbs for Depression Mini Reference was created to assist integrative psychotherapists and other health care workers in educating patients and their treatment teams on the known potential benefits and risks of integrating 26 herbs into treatment plans. Clinical herbalism should only be practiced within the confines of the federal and state laws in which you reside. If licensed, herbalism should only be practiced under that license, if doing so is within both the scope of practice of that license and your scope of competency. This reference should not be construed as a means for anyone to practice clinical herbalism without the requisite training needed to do so safely. Instead, this reference is for education purposes only, and should be used to educated patients and their treatment teams on the benefits and risks of herbs according to the empirical literature and experiences of clinical master herbalists. This reference is not to be used to provide patients with herbal recommendations; rather it is to be used to help professionals in their ethical obligation to reasonably support patients in their herbal healing beliefs while simultaneously maintaining patient safety. Patients who choose to use herbs frequently do so because of deeply held healing beliefs (Burton, Falkenberg, Smith, Zhang, & Zhang, 2013). Herbs can create clinically significant outcomes in patients suffering from mental and emotional issues (Mischoulon & Rosenbaum, 2008). Herbs can create clinically significant negative side effects if taken at improper doses or if contraindications are not identified (Ernst, 2003). Drug-herb interactions exist and potential interactions are a primary concern when patients use medications and herbs simultaneously (AARP & NCCAM, 2011). Research indicates that patient compliance to medication frequently increases when herbs are taken at the same time (Sarris, 2007). Research has found that 47% of patients' select herbs based off information obtained from the television, radio, internet, or family and friends (AARP & NCCAM, 2011). Outside of a few popular herbs, western trained physicians are rarely educated on the benefits and risks of herbs (Pirotta, Cohen, Kotsirilos, & Farish, 2000; see also Sarris, 2007). Patients frequently do not report their use of herbs to physicians because 1) patients sense that physicians do not have enough time to consider and integrate herbs into their treatment plan, 2) patients assume that because herbs are natural, they are therefore safe and have no need to report them to their physician, and 3) patients fear being criticized by their physicians for taking herbs and subsequently being told to stop using them. (Verhoef, White, & Doll, 1999; Barnett, Shale, Elkins, & Fisher, 2014). 1) Identify the herb(s) being used by the patient. The reasoning behind the patient's use of the herb(s). Are they using it because it is connected to a deeply held healing belief or simply because it was advertised on the radio? If known or easily accessible, what is the Latin name of the herb(s) being used? o What medications are they taking and have they checked to confirm that the herb(s) does not interact with them? Have they informed their prescribing physician of their use of herbs? If not, why not? What has been the patient's perceived effect of the herb(s)? How much of the herb(s) do they use on a daily and weekly basis? What form of the herb(s) are they taking (tea, liquid extract/tincture, capsule, etc.)? Are they working with an herbalist, or has this herb been self-prescribed? If so, who is the herbalist and what herbal training do they have? Are they open to you contacting their herbalist to coordinate care? 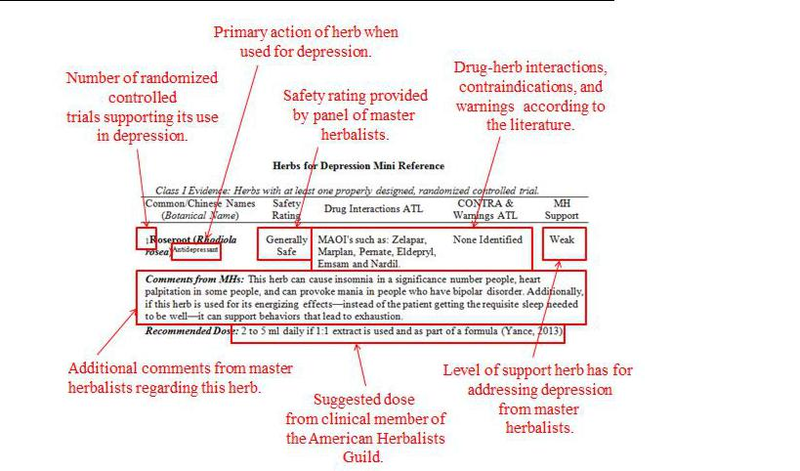 3) Check to see if the herb(s) is in the HDMR using the Herbs for Depression Quick Reference. 4) The HDMR contains all the herbs empirically indicated and those agreed on by master herbalists as useful in addressing depression as found in Einerson (2017). There are likely additional herbs empirically indicated by pharmacological research that were not identified in the reviews referenced. See Einerson (2017) for additional details. 5) Turn to each herb and help the patient/treatment team understand the level of evidence supporting the herb, its drug-interactions, warnings, contraindications, and suggested dosage. The example provided above is simply an example of how the HDMR might be used, in reality the HDMR can be used at any time in the therapeutic process to support the patient, educate the treatment team, and to reasonably assist in keeping patients safe. Regardless of how the HDMR is used to educated patients, it is important that the clinician understand the subjective nature of the tool. For example, the safety ratings and primary effect for each herb, and the level of support the herb has, each derive from the collective opinion of master herbalists and are not definitive in nature. Additionally, the comments, in narrative form, obtained by master herbalists are not 'collective' opinions, but are instead the opinion of a single master herbalist. The exception being when a statement is followed by a set of parenthesis, such as (3); this indicates the number of herbalists who contributed to this statement—in this example, three. Research on herbs is limited thus the information these master herbalists have provided are important and helpful in educating patients and other clinicians on the use of these herbs. To quickly become familiar with the type of information in the HDMR see Figure 1. For additional information regarding the sources, methods used, and conclusions made regarding the information provided by master herbalists, see Einerson (2017). Herbs with Class I evidence for depression: Herbs with at least one properly designed, randomized controlled trial. Herbs with Class II evidence for depression: Herbs with at least one controlled trial without randomization, or a well-designed, cohort or case-control analytic study; pharmacological, in vitro, or in vivo evidence. Herbs with Class III evidence for depression: Opinions of respected authorities, clinical experience of expert committees. Class I Evidence: Herbs with at least one properly designed, randomized controlled trial. Comments from MHs: This herb contains Pyrrolizidine alkaloids in the leaf and therefore increases the possibility of liver damage; the herbalists emphasize that this is not likely to occur but clinicians should be aware of this. Recommended Dose: 1-3 drops of tincture 1-3 times daily (Wood, 1993). Comments from MHs: This herb can affect CYP450 enzymes and the metabolism of drugs through these pathways. Precaution should be taken if used when patient is also taking multiple medications which can affect liver functioning or in patients with poor or declining kidney functioning (2). Kava can also interact with alcoholic beverages and can increase the likelihood of accidents and other issues related to the use of alcohol. In addition to those medications listed above, one herbalist reported that Kava interacts with Synthroid and Levoxyl. One herbalist reported that Kava can be used to help patients decrease their use of benzodiazepines if it is used cautiously and at the lowest doses possible; however, it was also noted that doing so can cause feelings of fatigue in the patient. It is recommended that Kava be used sparingly and not over long periods of time (2) as it was reported that frequent large doses can be habit forming and cause extreme apathy and scaly skin. It was also recommended that patients be educated on the use and interactions of Kava as to reduce the possibility of a nocebo effect. Recommended Dose: The standard dose is 2 to 4 g as a decoction, up to three times daily (Gardner & McGuffin, 2013). 3.0-8.5 ml of 1:2 liquid extract per day; 20-60 ml of 1:2 liquid extract per week (Bone, 2003). Comments from MHs:This herb is very safe but it may potentiate Benzodiazepines or drowsiness in sensitive patients. Recommended Dose: 2.0-4.5 ml of 1:2 liquid extract per day; 15-30 ml of 1:2 liquid extract per week (Bone, 2003). Comments from MHs: This herb can cause insomnia in a significant number of people, heart palpitation in some people, and can provoke mania in people who have bipolar disorder. Additionally, if this herb is used for its energizing effects–instead of the patient getting the requisite sleep needed to be well–it can support behaviors that lead to exhaustion. Recommended Dose: 2-5 ml daily if 1:1 extract is used and as part of an adaptogenic (Yance, 2013). Recommended Dose: 100-250 ml per day which equals approximately 1-5 strands (Pole, 2013). Comments from MHs: St Johns wort (SJW) affects the CYP3A4 and CYP2C9 enzymes and careful consideration should be taken when combining SJW with drugs metabolized by these pathways (2). Major negative interactions this herb has are with organ anti-rejection drugs and conventional antivirals commonly used in patients with HIV/AIDS. One MH considers these the most clinically relevant interactions SJW has with other medications. Two MHs report that they do not believe SJW is contraindicated with conventional antidepressants (2) or anxiolytics (2) but should be used in combination when supervised by a trained clinician. The research supporting Hypericum interacting with contraceptives, antidepressants, and anxiolytics, and subsequently concluding that these interactions cause negative effects that are clinically significant should be viewed cautiously as the research is of poor quality (3). Numerous MHs report using SJW extensively in patients taking conventional antidepressants without their patients experiencing a negative interaction. One MH disagreed with the list of interactions listed above because it did not distinguish the difference between hyperforin and hypericin and how these chemical constituents metabolize differently. This MH stated that much of the current literature fails to appreciate the difference between hyperforin and hypericin thussubsequently leads to misleading interactions such as SJW uniformly interacting with contraceptives. Conversely, one MH stated that regardless of the poor evidence supporting SJW causing negative interactions, she avoids using the herb concurrently with these medications as a precaution against unwanted pregnancy and serotonin syndrome. Recommended Dose: 2-6 ml of 1:2 liquid extract per day; 2-6 ml of 1:2 high hypericin liquid extract per day; 15-40 ml of 1:2 liquid extract per week; 15-40 ml of 1:2 high hypericin liquid extract per week (Bone, 2003). Note: Superscript Anxiety following name of herb = Primary action of the herb. Subscript1 prior to the name of the herb indicates the number of RCTs indicating significant positive results in treating or complementing the treatment of anxiety. *= indicates herbs with pharmacological, in vivo, or in vitro evidence. Parenthesis surrounding a number, such as (3), indicates the number of master herbalists contributing the statement preceding it. Class II Evidence: Herbs with at least one controlled trial without randomization, well-designed, cohort or case-control analytic study; pharmacological, in vitro, in vivo, or non-human experiment. Recommended Dose: 5-13 ml of 1:2 liquid extract per day; 35-90 ml of 1:2 liquid extract per week (Bone, 2003). Comments from MHs: In rare cases, this herb can aggravate patients and worsen depressive symptoms when severely depressed. Some women may also experience break-through bleeding and mood swings but report that these side effects will abate if the patient discontinues use of the herb. Recommended Dose: 1.0-2.5 ml of 1:2 liquid extract per day; 6 to 18 ml of 1:2 liquid extract per week (Bone, 2003). Recommended Dose: 30-50 drops of 1:5 tincture, up to three times a day (Winston & Maimes, 2007). Comments from MHs: Ginkgo has a blood thinning effect and must be used with caution in patients on blood thinners such as Warfarin and Heparin (5). Because of this, Ginkgo is contraindicated in patients pre-and post-surgery (2). Also, Ginkgo may modify the CYP2D6 pathway and any medications metabolized by this pathway may be effected. A minority of MHs feel that Gingko has little relevance in treating depression; or that its use should be limited to the elderly suffering from depression. It is viewed primarily as a blood thinner and cerebral circulatory stimulant. It was also reported that Gingko can cause severe headaches in some people. Additionally, although the seeds should not be consumed, one herbalist noted that if the outer skin is removed it is considered food in Chinese medicine. Recommended Dose: 3-4 ml of the standardized (2:1) liquid extract per day; 21-28 ml of the standardized (1:2) liquid extract per week (Bone, 2003). Comments from MHs: One herbalist advised caution when using this herb in patients with premenstrual syndrome, hypoglycemia (or simply a sensitivity to blood sugar issues), and thyroid disease. Those with chronic anxiety or trauma who are sensitive to stimulating herbs should use this herb cautiously (3). Another MH noted, however, that if this herb is used in a formula, its negative effects can be offset by other herbs. Recommended Dose: 1-6 ml of 1:2 liquid extract per day; 7-40 ml of 1:2 liquid extract per week (Bone, 2003). Recommended Dose: 3-6 ml of 1:2 liquid extract per day; 20-40 ml of 1:2 liquid extract per week (Bone, 2003). Recommended Dose: 40-80 drops of 1:5 tincture, up to three times a day (Winston & Maimes, 2007). Class III Evidence: Opinions of respected authorities, clinical experience of expert committees. Comments from MHs:This herb interacts with many blood thinners such as Xarelto, Heparin, Warfarin (4) and should not be used prior to surgery as it has blood moving and thinning properties. One herbalist reported that it likely caused excessive menstrual bleeding in at least one patient. One herbalist would consider using it concurrently with medications such as Pradaxa but warns that doing so may result in the patients experiencing an increased bleeding, and perhaps a heavier menstrual cycle. Recommended Dose: 1.0-2.5 ml daily of 1:3 tincure (Hobbs, 1984). Comments from MHs: In addition to noting this herb's high level of safety, one herbalist noted that patients using it concurrently with heavy doses of anti-inflammatory medications or blood thinners should do so with care, as this herb may increase these effects. Recommended Dose: 3-6 ml of 1:2 high-grade liquid extract per day; 20-40 ml of 1:2 high-grade liquid extract per week (Bone, 2003). Comments from MHs: This herb may interact with blood thinners and may increase bleeding time. Recommended Dose: 4 to 10 ml daily when using a 1:1 extract (cultivated in Russian); dosage for dried or powdered root is 500 to 1,000 mg a day (Yance, 2013). Recommended Dose: 250-500 mg in capsules daily (Hobbs, 1984). Comments from MHs: One herbalist noted that this herb may interact with blood thinners. Recommended Dose: Standardized extract (ursolic acid >2.50 percent):200 to 500 mg daily; 1:1 fluid extract: 3 to 5 ml daily; tac: 2 to 4 cups daily (Yance, 2013). Recommended Dose: Oats seed – 3-6 ml of 1:1 liquid extract per day; 20-40 ml of 1:1 liquid extract per week. Green oats – 3-6 ml of 1:2 ml liquid extract per day; 20-40 ml of 1:2 liquid extract per week (Bone, 2003). Recommended Dose: Crude raw fungus for decoctions: 2 to 6 grams daily; 1:1 fluid extract: 2 to 10 ml daily; standardized extract 10 to 14 percent polysaccharides, 4 percent triterpenes: 1 to 4 grams daily (Yance, 2013). Comments from MHs: One MH reported that this herb may interact with blood thinners but no specifics of this interaction was provided. Recommended Dose: 3.5-8.5 ml of 1:2 liquid extract per day; 25-60 ml of 1:2 liquid extract per week (Bone, 2003). Comments from MHs: This herb may have an additive effect to sleep medications. Recommended Dose: 4.0-6.0 ml of 1:5 or 1:4 tincture 2-3 times daily (Hobbs, 1984). Note: Superscript Depression following name of herb = Primary action of the herb. Parenthesis surrounding a number, such as (3), indicates the number of master herbalists contributing the statement preceding it. AARP, & NCCAM. (2011). Complementary and alternative medicine: What people aged 50 and older discuss with their health care providers. : Author. Barnett, J. E., Shale, A. J., Elkins, G., & Fisher, W. (2014). Complementary and alternative medicine for psychologists: An essential resource. Washington, DC: AmericanPsychological Association. Bone, K. (2003). A clinical guide to blending liquid herbs (1st ed.). St. Louis, MO: Churchill Livingstone. Burton, A., Falkenberg, T., S. Mischoulon (2008) Smith, M., Zhang, X., & Zhang, Q. (2013). World Health Organization traditional medicine strategy 2014-2023 (ISBN 978 92 4150609 0). : World Health Organization. Einerson, L. (2017). A Delphi study on herbs used to address depression and anxiety according to master herbalists (Doctoral dissertation). Ernst, E. (2003). Serious psychiatric and neurological adverse effects of herbal medicines: A systematic review. Acta Psychiatrica Scandinavica, 108, 83-91. Hobbs, C. (1984). Foundations of Herbalism (1st ed.). OK, CA: Botanica Press. Mischoulon, D., & Rosenbaum, J. F. (Eds.). (2008). Natural medications for psychiatric disorders: Considering the alternatives (2nd ed.). Philadelphia, PA: Lippincott Williamsand Wilkins. Pirotta, M. V., Cohen, M. M., Kotsirilos, V., & Farish, S.J. (2000). Complementary therapies: have they become accepted in general practice? Medical Journal of Australia, 172(3), 105-109. Pole, S. (2013). Ayurvedic Medicine: the principles of traditional practice (2nd ed.). Edinburgh, England: Churchill Livingston Elsevier. Sarris, J. (2007). Herbal medicines in the treatment of psychiatric disorders: A systematic review. Phytotherapy Research, 21, 703-716. Verhoef, M., White, M., & Doll, R. (1999). Cancer patients’ expectations of the role of family physicians in communication about complementary therapies. Cancer Prevention and Control, 3(3), 181-187. Winston, D., & Maimes, S. (2007). Adaptogens: Herbs for strength, stamina, and stress relief (1st ed.). Rochester, VT: Healing Arts Press. Wood, M. (2008). The earthwise herbal: A complete guide to old medicinal plants. Berkeley, CA: North Atlantic Books. Yance, D. (2013). Adaptogens in medical herbalism: Elite herbs and natural compounds for mastering stress, aging, and chronic disease (1st ed.). Rochester, VT: Courier Companies.